Teachers debrief with Shelley after observing reading workshop in Kindergarten. As we walked into the classroom, we were greeted by 20 smiling faces, eyes wide and amazed to see so many adults in their room at one time. “Today, you will be our teachers,” explained our host and my fellow literacy coach, Shelley Fenton. The students sat up tall, happily accepting the task at hand. Their teacher immediately came over, extended her hand and introduced herself to each of us. Feeling welcomed, my colleagues and I took a seat and eagerly began to take in all aspects of reading workshop: the classroom environment, the student and teacher resources and the teacher’s masterful instruction. With the words, “Readers, today we are going to …“ we eagerly awaited today’s mini-lesson. My district is in the process of making the curricular transition to Reading workshop. Grades 3-5 are currently using the Teachers’ College Units of Study in Reading and next year Grades K-2 will do the same. 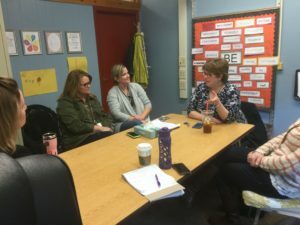 While I have spent this year modeling lessons and facilitating Professional development on the components of Balanced Literacy, probably the most valuable PD opportunities the teachers have experienced is visiting other schools. This week we had the good fortune to visit Shelley’s district. I took teams of Kindergarten, First and Second-grade teachers (all on separate days) to observe workshop in action. We learn best from seeing instruction in action. Immediately following our visit, one of my colleagues commented that “We learn best from seeing and doing.” She is so right! It is one thing to read about what goes in a student’s book bin, it is another to listen to a student explain the contents of the bin and how it helps him grow as a reader. During our visit we observed shared reading and reading workshop complete with mini-lesson, independent and partner reading, conferring, small group instruction, mid-workshop teaching, and share. While I have shown videos of these same teaching structures, listening in on student conversation during Active Engagement, observing what the other students are doing during conferences, and thumbing through student folders inspires questions, conversations, and new ideas. “Check out the students’ individual word walls!” said one teacher to another. “I notice how she organized her library, I’d like to have book bins organized by topics and genres,” shared another. The room buzzed with excitement. Seeing workshop come to life leads teachers to take in what they see and consider what they might want to try in their own classrooms. It inspires them to imagine the possibilities! Host teachers share resources that foster student independence and growth in reading. Curricular change is hard. For some teachers, moving to Reader’s Workshop feels like a small shift, for others a giant leap. Having the opportunity to talk with other teachers who have taken this journey is incredibly valuable and reassuring. Following our classroom observation, we regrouped in Shelley’s office and had time to speak with her and the teacher whose classroom we visited (who I am referring to as our host teacher). I could see my colleagues physically relax when the teacher we observed said: “We were exactly where you are.” These words communicate that we are with you, we get it. She also reminded them that this transition is a process and offered the wonderful advice: “Don’t take it all on. This is a 3-5 year process. Get really good at something each year.” Transitioning to workshop is a process; take it one step at a time. School visits provide opportunities to ask questions that are not covered in a manual. During our debriefing time, teachers were able to ask the host teacher questions like: Do you have substitute teachers teach reading workshop? How do you prevent students who leave the classroom to receive services from missing components of balanced literacy? How do you manage your classroom library? While there is lots of professional advice out there, hearing an individual teacher’s experience feels more relevant. It also sends the message that it is okay to try things out and make adjustments along the way. There is power in hearing ideas from grade level colleagues. During our visit, Shelley and our host teachers reinforced some of my suggestions for best practices. 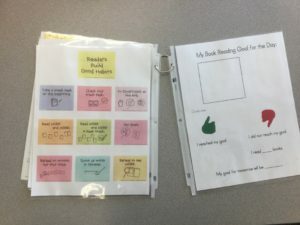 For example, Shelley and the teachers who we observed stressed the importance of reading A Guide to the Reading Workshop, which accompanies the Units of Study, in order to gain insight into workshop before diving into the individual sessions. After our visit, my colleagues and I agreed on chapters to read before our next professional planning day. Our first-grade host teacher advised us to embrace the units completely adding, “Don’t modify it. See it from beginning to end.” During a similar conversation the following day, the second-grade host teacher explained that once you feel comfortable with the mini-lesson structure: connection, teach, active engagement and link, you can more easily substitute content. This is a message I stressed when we took on Writing Workshop a few years ago. School visits generate energy and excitement. School visits provide insights for Literacy Coaches. Expanding our Personal Learning Network beyond our classroom walls. With questions answered, concepts clarified, ideas born, and emails exchanged, we returned to our district with an increased sense of confidence and a plan for how to move forward. Our colleagues at South Glens Falls eagerly shared their contact information inviting us to reach out any time and come back next year. After our day, my colleagues can now count their host teachers and Shelley as members of their Personal Learning Network. When I was in college, I kept a notebook of all the wonderful things I saw going on in each classroom I visited. As I started out my teaching journey, I kept the worn notebook handy and tried to implement as much as I could. This is a great reminder to never stop visiting, observing, and keeping a notebook…though now I’m sure it would be digital!